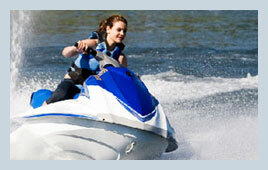 If you or a loved one has been hurt in a boating or personal watercraft (PWC) accident, Steele Law, P.C., can help. We are dedicated to standing up for the rights of people who have suffered serious injuries on the water due to the negligence of others. When you choose us to represent you, we will work hard to build an aggressive, creative legal strategy that is designed to get you results. Steele Law, P.C., represents people in serious personal injury and wrongful death cases in Lewisville. We work with clients in Fort Worth, Dallas, and the surrounding areas of Texas, including those in Carrollton and Plano. "Like many people throughout Texas, I enjoy spending leisure time on the area's lakes. When I have the chance, I visit Lake Lewisville, Grapevine Lake, and Lake Texoma. I own and drive a personal watercraft, a jet ski, so I understand how dangerous the water can become when another boater or PWC driver acts negligently." Creativity is a key ingredient in the service our law office provides. When we build a legal strategy, we look for opportunities to employ new methods and new ideas, ones that the defense has not seen before. Since they have not seen them, they do not know how to defend against them. In addition to our creativity, we bring a decade of legal experience and knowledge. We have specifically devoted our careers to personal injury cases. We understand the law, and we work hard to put it into action to get what is right for you. When we represent you in PWC and boating accident cases, we provide you the personal, one-on-one attention you deserve. Your case will not be passed around from one attorney to the next or to an inexperienced paralegal. Your case will be handled by an experienced Lewisville personal injury lawyer who will know you by your name, not your file number. For a free consultation with a dedicated boating accident lawyer, contact our attorney online or call (214) 333-9393 today to arrange your free consultation. From serious injuries to alcohol-related boating fatalities, we are here to help. TX Personal Watercraft Injury Lawyer Disclaimer: The information presented on this site should not be construed to be formal legal advice nor the formation of a lawyer or attorney client relationship. Any results portrayed here were dependent on the facts of a particular legal matter and results vary from case to case. Please contact an attorney at Steele Law, P.C. for a consultation on your particular case.